Marvel characters M.O.D.O.K., Hit-Monkey, Tigra, Dazzler, and Howard the Duck are all getting animated at Hulu. In “Marvel’s Tigra & Dazzler Show,” two Super Heroes and best friends, Tigra and Dazzler, fight for recognition among powered people who make up the eight million stories in Los Angeles. “Marvel’s Tigra & Dazzler Show” comes from writers Erica Rivinoja and Chelsea Handler, with Rivinoja, Handler, and Jeph Loeb serving as Executive Producers. 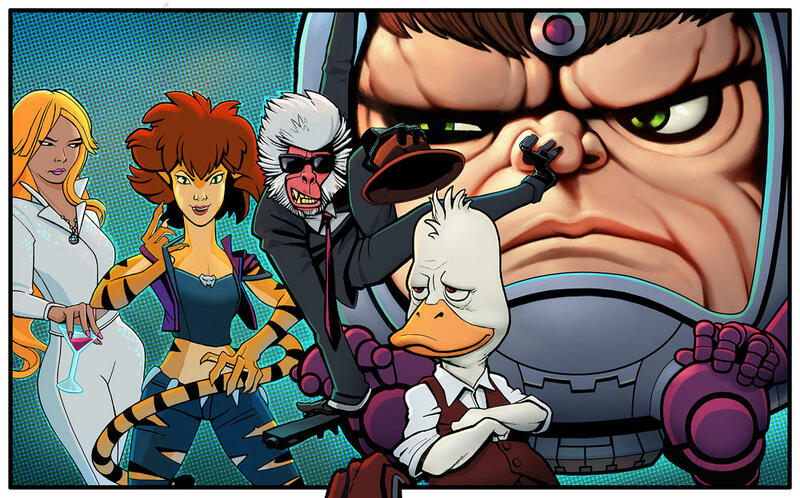 Trapped in a world he never made, America’s favourite fighting fowl Howard the Duck hopes to return home with the help of his unstoppable gal pal Beverly before the evil Dr. Bong can turn him the crispiest dish on the menu, in “Marvel’s Howard the Duck.” “Marvel’s Howard the Duck” comes from writers Kevin Smith and Dave Willis, with Smith, Willis, and Jeph Loeb serving as Executive Producers.